In the 1970s and 80s my parents seldom went to a restaurant alone, but usually took my brother and me along. For an Italian family, there was nothing unusual in this, but we were an Italian family living in England, so I will always feel lucky for the way that my parents included us. In retrospect, going to (mostly) Italian restaurants was probably not only a safety blanket against homesickness for my father, but a way of helping my brother and me connect to our heritage more often than the annual trip back to Italy in the summer. Being a kid, my favourite part of dinner was dessert and I would choose something different every time we went. And so it was that I made friends with unctuous panna cotta, so gently held together that it vanished in your mouth, leaving you feeling almost cheated of the bite; chic cassata romana, the candied citrus and cherry peeping patriotically out of the gorgeous gelato; and when old enough for the taste of coffee, trendy tiramisù. While I was making my culinary ascent up the menu, my brother would always order the same thing which to me seemed the most boring item on the menu and soon became the one thing I would avoid on principle: torta di mele con gelato—apple pie with ice-cream. Every time he’d order it, I remember rolling my eyes as only a younger brother can and trying to convince him to order something else (that I might sneakily get a taste of). But my brother was much more loyal to his after-dinner friend than I was with my sidelined sweetmeats, and torta di mele con gelato it was. My refusal to eat apple pie soon extended itself to the fruit itself. Apples had got our first ancestors into all sorts of trouble after all, hadn’t they? And the Bramley boycott lasted well into my thirties. Every time I saw apple pie on the menu I’d mentally delete it from ordering possibility. In fact it was moving to Paris and learning pâtisserie that tempted me to try this self-forbidden fruit and I wasn’t expecting the result. Who knew that no two apples were equal? Certainly not me. I was shocked, surprised, and delighted to discover that far from being the bland fruit I remembered from childhood (often stewed to within an inch) there was a whole range of flavours and textures waiting to be discovered. The most pleasant discovery was the range of apples which had the slightly acidic taste which I adored in red fruit—still my favourite. I was soon knocking up, and enthusiastically knocking back, tartes aux pommes, the fruit itself, and of course the legendary tarte des demoiselles Tatin which became one of my specialities. This recipe is based on a traditional crostata di mele. A little bit of care and attention has turned it into something impressive enough for a dinner party but simple enough for everyday baking. It uses a mixture of sweet and acidic apples for flavour, but also for texture. Acidic apples tend to keep their shape and texture even after a long bake and so the layers of apple on top of the tart give a nice crunchy contrast to the stewed apples underneath. A good pairing would be Granny Smith and Golden Delicious, but you can substitute according to what you can get locally. You can buy shortcrust pastry, but I prefer to make my own. It does taste better and isn’t really hard to make but you have to be careful to rest it in the fridge before rolling and after you fill the tart tins, otherwise it will shrink when blind baking. If you notice that the pastry shrinks back while you are rolling it out, it hasn’t rested enough so stick it back in the fridge. I like to make my pastry the day before use and leave it in the fridge overnight. Then I fill my tart tins first thing in the morning, and stick them back in the fridge until ready to use. This is foolproof. These tarts can be served hot or cold. If serving them hot, don’t bother with the caramel cream as it will melt, but instead fill the hole in the middle with more stewed apple. The caramel pastry cream recipe below is adapted from Christophe Michalak, one of my favourite French pâtissiers from whom I have learnt a lot. The rest of the recipe is my own. When I was in France, I learnt to use French pastry rings for tarts. These are a little tricky at first but are a surefire way to avoid one of Mary Berry’s famous soggy bottoms (US readers, google that and you’ll understand). But these can be made in any tart tin you like. Anyway, here’s the recipe. Let me know what you think, and buon appetito! 1. The day before, put the milk into a saucepan and bring to the boil. 2. Put the leaf of gelatine in cold water and soak for about 10 minutes. 3. Place the sugar into a separate saucepan and melt it over a high heat to form a golden caramel. As soon as it is the colour you want, remove it from the heat and add the milk, little by little, whisking it as you go along. 4. In a bowl, whisk together the egg yolks and cornflour and then add the caramel milk mixture. 5. Put this mixture back into a saucepan and bring to the boil, whisking all the time. Simmer for 1 minute until it begins to thicken. 6. Remove it from the heat, add the gelatine and whisk until it has dissolved. 7. Leave to cool for about 5 minutes and then add the butter in very small quantities combining it with a hand blender. 8. Transfer the cream to a bowl, cover it with cling film in contact with the cream and place in the fridge overnight. 1. Sift the flour into a bowl together with the salt and sugar. 2. Cut the butter into small cubes and add to the bowl. Then, using your fingers rub the butter into the flour until the consistency of breadcrumbs. 3. Add the water, little by little, mixing with your hand until the ingredients come together. 4. Knead the dough briefly, about 1 minute, make into a ball, wrap in clingfilm and then place in the fridge for at least one hour, preferably overnight. 1. Peel all the apples and remove the cores using an apple corer. 2. Take three sweet apples and three acidic apples and cut them into 1/2 cm slices using a mandoline. 3. Using a 6cm pastry cutter, cut out six rings from slices of sweet apple , making sure that the hole cause by the corer is in the centre. Then do the same using a 5cm cutter, a 4cm cutter, and a 3cm cutter. 4. Repeat the last instruction with the acidic apples. Reserve both sets of slices in water until you need them. 5. Chop the wasted apple into small pieces. 6. Take the remaining sweet apple and acidic apples and chop into small cubes. Place these and the pieces of wasted apple in a saucepan with the sugar and water, bring to the boil and then simmer until you have a soft mixture, about 15 minutes. Leave to cool. 1. Heat the oven to 180° C (355° F). Roll the pastry until it is about 1/2 cm thick and then line the pastry rings. Place them in the fridge to rest for at least one hour. 2. Prick the bottom of the pastry with a fork, and then blind bake them with beans for 15 minutes and then without beans for another 5 minutes. Leave them to cool. 3. Fill the pastry cases to the brim with the stewed apple. Then place one of the 6 cm disks of acidic apple on the top and sprinkle with a little sugar and cinammon. Then place the 6cm disks of sweet apple on top of that and sprinkle with sugar and cinammon. Repeat this with the other disks in decreasing sizes to form a kind of layered pyramid on the top of each tart. 5. Meanwhile make the glaze by heating the jam and water in a saucepan. 6. 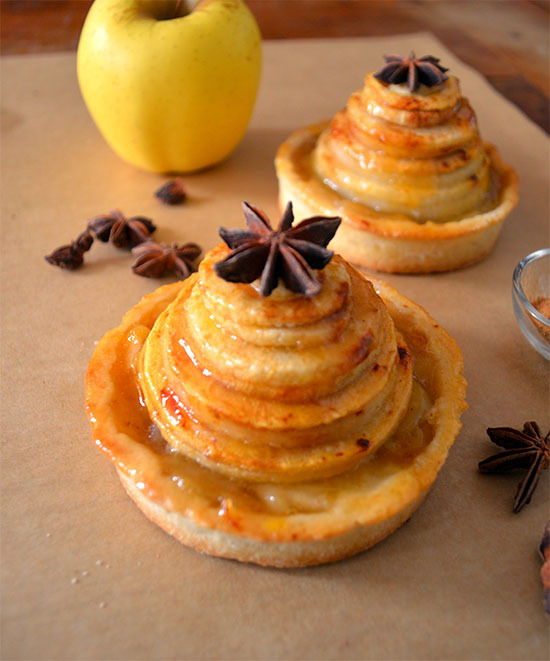 If you are serving the tarts hot, remove them from the oven, fill the hole in the centre of the pyramid with stewed apple, paint the glaze over the whole of the tart with a brush, and add a piece of star anise as a garnish. 7. If you are serving the tarts cold, allow them to cool completely. Then using a piping bag, fill the hole in the centre with the caramel cream and then paint the glaze over the whole of the tart with a brush and add the star anise as a garnish. Tuscan art … on a plate? Lovely recipe, thanks for the mention. Looking forward to eating this! These look delicious Luca. I love how beautiful they are and the pyramid structure. I completely agree with you about apple pie. I’ve always thought of it as safe and boring, but it’s a tried and tested formula that works. Thanks for the feedback 🙂 I agree. That’s why even without the caramel creme patissière they taste amazing. I think it’s all about the balance of the fruit and the sugar. Apples are definitely one of my favourites now. So glad you’re back on board with apples ‘cos these look fabulous….bravo! So am I because they were delicious too! Thanks for the feedback. Oh yum, these look apple-tastic, and such an evocative story of restaurants when you were young! It’s hard to admit that older brothers were sometimes right eh? Thank you! I’m glad you liked the story. You have a younger brother, I’d guess? When I was developing this I had the idea to put a whole apple on the top but this looked better. In fact, if you count the compote and the slices you get more than a whole apple per tart. So impressive Luca, would make a great dinner party dessert! Thanks Stuart. The slicing and cutting is a little work—but not too much by any means—but I think the result is very effective. It goes to show that with a little extra thought quite simple dishes can be re-presented to look awesome.